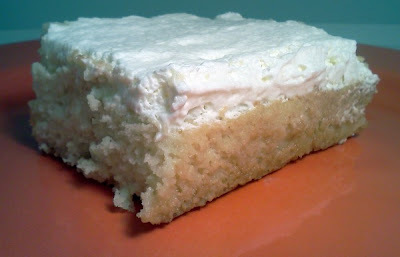 This past week I've had the pleasure of making three, yes THREE, Tres Leches cakes. What's that you ask, well let me throw a little bit of knowledge your way! Tres leches is Spanish for three milks, you make a cake, mix three milks together, pour it over said cake, top it with some whipped cream, and BAM you have yourself some tasty tastiness. Preheat oven to 350 degrees. Spray a 9x13 baking dish with cooking spray and set aside. In a large bowl combine flour, baking powder, and salt, set aside. In the bowl of your stand mixer cream together the butter and sugar until light and fluffy. Beat in the eggs one at a time. Then finally beat in the vanilla. Add in the flour mixture and 1/2 C of whole milk alternately , starting with flour and ending with flour, in three segments (keeping up with the TRES!) Scrape the batter into the prepared pan, it will be thick , no worries. Bake for 25 minutes, or until light golden brown and toothpick inserted in center comes out clean. Cool cake COMPLETELY. 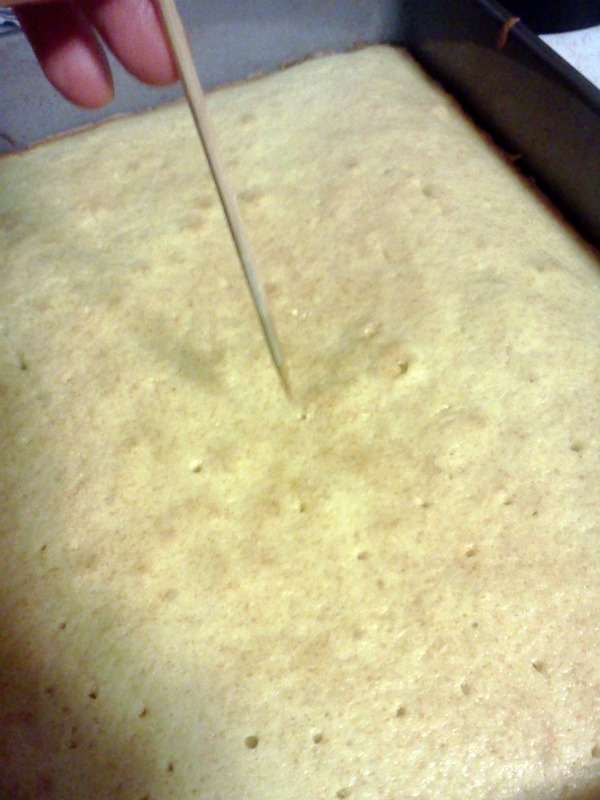 Once cool, poke holes in the cake using a bamboo skewer or a fork whatever you like. Mix all the milks and vanilla together and pour over entire cake. It will look like the cake is drowning but no fear, give it like 10 minutes or so and it'll all be soaked and ready to go. While waiting for the milk to be sucked up in the cake (don't you just love my professional sounding words?) beat the heavy cream, vanilla, and sugar until stiff peaks form. Spread all over cake and chill. You can serve with fresh berries, or eat as is. I'm not sure reading your blog is a good idea for me-I will want to bake nonstop. I need some low-fat recipes my way mama!